Life poses many questions - Dying is one of them: What do we do at the moment of death? For the most part, we deny death. Death doesn’t really have a place in our busy every-day lives. We never really look into the nature of death as a cycle of life. We never examine our reactions; therefore, we never give ourselves the chance to practice how to die; as Warrior Saints, gracefully and courageously. This denial produces either fantasy or fear in the subconscious, which blocks prosperity and creates disease in our lives and our relationships. We must learn how to confront the moment of death and determine our Self within it so that we can 'cross over'. Merging with the Infinite - Quotations and Kriyas on Death & Dying is s stunning book on this much ignored, yet amazingly present topic. 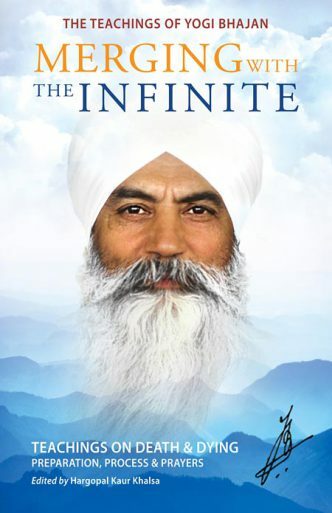 The editor, Hargopal Kaur Khalsa, has put together a vast treasure of quotes and lectures of Yogi Bhajans, enriched with Kundalini Kriyas which do not only focus on death – but can make your life more colorful, more aware and more happy.